this iPhone Transfer Photo is an easy to use photo backup software that lets you copy photos from your iPhone to a PC with the least effort. Apple iPhone had integrated all your photos into an ithmb file which user can not access the content directly, Tansee iPhone Transfer Photo utilizes iPhone's internal database to display and transfer your iPhone's photos instantly. you can backup or copy photos in iPhone to PC or copy photos to a new iPhone. ...... Photo utilizes iPhone's internal database to display and transfer your iPhone's photos instantly. 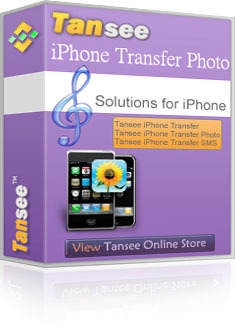 With Tansee iPhone Transfer Photo, iPhone users can transfer iPhone photos to PC easily. Tansee iPhone Transfer Photo had many special settings for your personal iPhone photo backup, you can customize browser style, backup file format (.BMP or .JPEG)... . We had also realized iPhone auto detection feature, whenever you plug your iPhone to the computer, Tansee iPhone Transfer Photo could display all the iPhone photos instantly. From now on, you can backup all your iPhone photos to any computer. Try Tansee iPhone Transfer Photo Now! you will find more! Tansee iPhone Transfer Photo's authour has established two support teams for building a fast response to customs. Just email to support Team 1 or support Team 2, the authour will answer your e-mail within 24 hours all year round! Qweas is providing links to Tansee iPhone Transfer Photo 3.6 as a courtesy, and makes no representations regarding Tansee iPhone Transfer Photo or any other applications or any information related thereto. Any questions, complaints or claims regarding this application Tansee iPhone Transfer Photo 3.6 must be directed to the appropriate software vendor. You may click the publisher link of Tansee iPhone Transfer Photo on the top of this page to get more details about the vendor.